I had been humming a lullaby to my little girl at bedtime. I thought she was almost asleep – I certainly seemed to have put myself in a little trance. But then she asked for “more Hmmhmm” and suddenly I was so choked up, I could barely get the basic notes out of my throat. The tears started sliding down my face before I even knew what was happening. I don't know what it was that reminded me of him. It was just a simple lullaby – the most overused one there is, actually. And I certainly was not humming it very well. He definitely would have given me the eyebrow for that one. Something about the way she said it, though, brought a flash of him to my mind. We are already at the 1 year anniversary of his death and I'm still having a hard time wrapping my brain around it. The day I learned he died, I knew I had to write something about him because what else could I do? Writing is what I always turn to when I don't know what else to do. But this was a hard one. Nothing that I could ever say seemed like it would be fitting for a man who has touched literally thousands of lives. I guess that's why it has taken me a year to do it, and I still can't seem to get it right. Every time I pull out a piece of paper, nothing ever seems to work. It still doesn't, but yet, I know it's something I need to do. He was a complicated man that lived simply and beautifully in so many ways. He lived his life the way he wanted to and called all the shots, right up to the very end. Humble and fiercely private, he managed to make everyone around him feel like a special friend. To me, and to so many others, he was a mentor, a friend, a father, a teacher, a brother, a confidante, and most certainly an inspiration. It seems cliché to say a music teacher changed your life – especially after Mr. Holland's Opus came out – but Ned B. Fleischer was Mr. Holland times 1000. Every student that came through his chorus room over the years were all affected by his music – both literally through his piano and the voice lessons, and by the music of his life. As a young man, he made a decision to follow his dream instead of the “practical” path he was currently on. And in doing so, he lived a life that has influenced so many others. Mr. Fleischer loved his “Kiddies” as he called all of us. He came into our lives at the rough high school age and somehow managed to be there for each and every one of us. He inspired everyone he met to be better. We never wanted to disappoint him. After his death, one girl told me that she thinks she would have gotten herself into a lot of trouble if it wasn't for him. She didn't want to have to see that look of disappointment in his eyes, so she would often stop herself and think of what Fleischer would say before she made a decision. And she wasn't the only one. 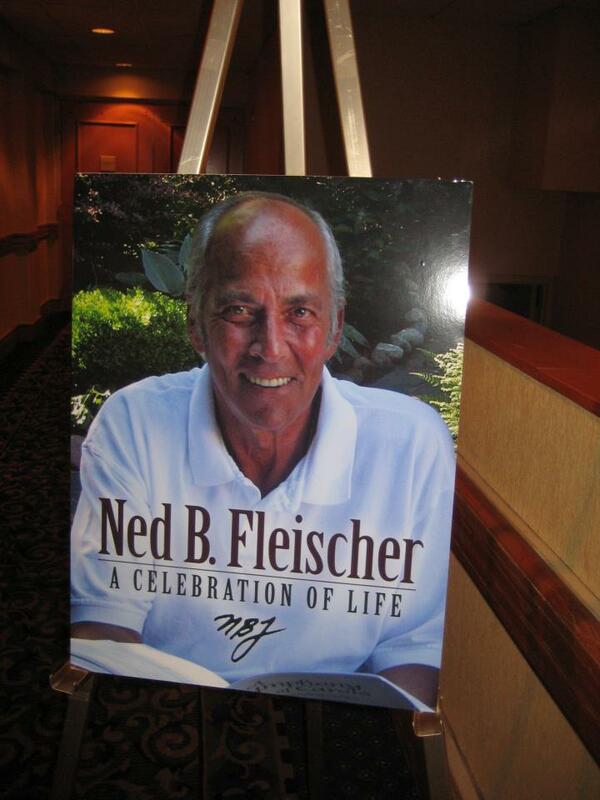 I've heard countless tales of former students who managed to survive high school mainly because of Mr. Fleischer. He had these eyebrows that worked in so many ways. He constantly was reminding us to raise our eyebrows while we were singing (oddly, it helps you to hit the high notes and to stay in tune), but all he had to do was raise an eyebrow at us and it would snap us back in line. He never needed to yell. He just had to give us The Look. Every Kiddie out there knows The Look. It sounds like this man is up on a very tall pedestal, but the thing is, he was just as human as the rest of us – and I think that might be what made him even more endearing. He was addicted to coffee, cigarettes, cough drops, and more cigarettes. He could be moody, always had a tan, and was bizarrely attached to this humongous, hideous fern that was always in the corner of the chorus room and just wouldn't die (damn fern). He refused to tell us what the “B.” stood for in his name (we knew it wasn't Butch, regardless of what he said). And despite the news stations ruining his fun and announcing his whole name when he passed, we'll still pretend we don't know. A self proclaimed atheist, he also hated attention on himself. Despite being one of the most talented people I know, he constantly pushed off any accolades and attention to his students. He would probably hate that I'm writing this. He definitely would have hated that there was a memorial celebration. And although it made him feel good to know how much we loved him, he would most certainly be rolling his eyes at the attention his sudden death caused. The news of his death spread like wildfire and Facebook blew up with all his Kiddies from around the world coming together to share anecdotes and tributes to the man who managed to touch all of their lives. I, personally, was more torn up than I ever thought I would be. Your mind knows that the special people in your life are eventually going to leave this earth, but your heart just expects them to always be there. There was always a spot for you in that chorus room (just don't touch the fern). A wave of guilt washed over me as I crumpled hearing the news. It had been a long time since I'd been in touch with him – too long. Life's usual “busyness” got in the way. I had become a new mother, we moved, my job situation was changing. Despite thinking of him often, I hadn't reached out like I used to. And I know he wouldn't be bothered by that. He always wanted to see us move on with our lives and live up to our potential. But it bothered me. I wanted him to meet my daughter. Literally days before his death, I had the thought that I needed to figure out where I put his email so I could send him a picture and maybe set up a coffee date or something. However, I knew it was buried somewhere in all the boxes from our recent move, so I put it off. And then the news came that I would never be able to reach out to him again. It was crushing. He was a pillar in so many of our past worlds. And now he was suddenly gone and there is a void left there that I think many of us still do not know how to fill. The thing is, he's not really gone. A little piece of him has been embedded into each and every one of his Kiddies. Just take a look on Facebook. You'll see a large community of people, of all ages, from all over the world, that have come together. Even in his death, he still is uniting us and providing us with a support system. We are the full chorus of his life, harmonizing in new ways. His strong sense of humor and his love and respect for all of us is reflected in those posted messages. You can see those eyebrows raise, you can smell the cigarettes, and can feel the eyes rolling behind your back. You hear his laugh echo, and the voice that will always linger in the back of your mind. You can still listen to him mercilessly tease you. You can feel his sincerity as he watches over your life. You continue to want to live up to his opinion of you. You still don't want to disappoint him. Even if it has been years since you spoke to him, he was, and is, always a part of your life in some way. His life was the most beautiful melody in so many ways and it's reflected in each and every one of his Kiddies. Every time I hear an exquisite piece of music, he is there. Every time I do something crazy, I hear his laugh. Every time I reach for a dream, I feel his smile. Every time I notice the melody in my daughter's laugh, I know that even if he is not physically here, he continues to live on. His effect will still be passed on to the next generation. His inspiration lives on in all of his Kiddies and everyone he influenced along the way. I obviously don't know what the deal is with heaven. If it does truly exist, do atheists end up there anyway when they die? I don't know. But I like to think he's up there, rolling his eyes that he's stuck there in the first place, and still watching out for all of us. I like to think that someday I will get to see him again and be greeted with his, “Jennahhhhhhhhh.” He's probably taken over directing the angel choir and teaching them the right way to say “Alleluia” (NO DIPHTHONG!!). He's annoyed at all the attention, but he's happy that his Kiddies have been able to all get together. He still expects us to do our best to live our own lives – to try to achieve our dreams, no matter how impractical they may seem. He still expects us to show up at 7:52 on the dot. It is still our jobs to appreciate a beautiful piece of music. I may sometimes feel like I'm not living up to his expectations. I certainly have not lived up to my musical potential, unfortunately, but that happens in life sometimes. And maybe “Hmmhmm” is all that really needs to be said anyway. The point is that it's still there. He's still here in his way. I may not have been able to tell him everything I wanted to. I didn't get to say thank you before I had to say goodbye. But, he knows. So, Mr. Fleischer, I lift my eyebrows up to you. And there will always be more Hmmhmm. “Make sure people know how much I loved my life. I have no regrets, and consider myself to be among the luckiest people on Earth. I get to do what I loved for a living, and for some strange reason, I have Kiddies still in touch with me years and years after they graduate. Well done, Jenna. That was lovely. Just beautiful.....beautiful and thank you for sharing your heart friend. Thank you, Anne. It is quite the community he built, isn't it? Thank you so much for sharing this, Emily! It means a lot to me. I'm glad that this post has been able to resonate with so many people. The stories I have been hearing from his Kiddies have been so touching and healing in their own way. And I am so happy to hear that you reached out as well, and he would be too. I truly hope that it works out for you and that you get the answers you need. It is so inspiring to see that he still is able to push us to do the things we need to. I know that I have begun to make some changes with him in mind as well. We are indeed, very, very lucky to be a part of "Ned's Kiddies"!